When it comes to a redhead’s makeup routine, one of the biggest challenges is finding the right color for emphasizing eyebrows and eyelashes. This can be tricky, since most natural redheads have either very light copper brows and lashes or barely-there blondish-white ones. That coloring poses a problem with too-dark mascara—if it isn’t applied all the way to the lash line it’s really noticeable. Same goes for eyebrow products that are too dark. So, how are you supposed to make brows and lashes look natural on hairs that are almost invisible? It’s easy, according to Los Angeles–based makeup artist Christina O’Hara. With O’Hara’s help, we put together this quick-guide for redheads. • Tinted brow gel. Match the color of the gel to your hair for the most natural-looking result; we used Anastasia Tinted Brow Gel in Brunette. 1: Take the brush from your brow gel and wipe excess gel onto the lip of the tube (similar to how you would with mascara). 2: Start at the inner corner of your eye and brush outward, in the same direction the hair grows. 3: As you apply, use the tip of the brush wand to help re-style the shape of the brows. 4: To finish the look, use one of the clean extra brow brushes and go over the brow hairs to separate and break up. 5: Repeat on your other brow, using the second clean brush. 1: Curl lashes. Look down, press curler onto lashes, hold it, remove, and repeat, moving down your lashes until they’re curled to your liking. 2: Take the mascara wand and apply product to lashes, rocking back and forth horizontally as you swipe up and out. 3: Use the fan brush to get in between the lash line. 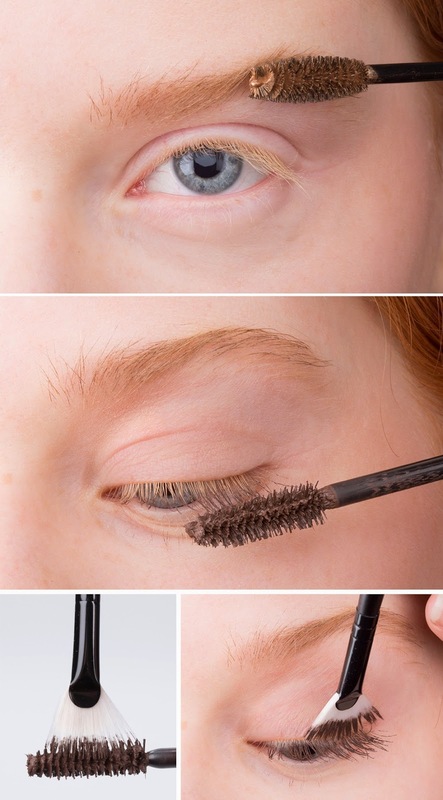 Rather than dipping the brush into the mascara bottle, wipe a bit of the product onto the brush using the mascara wand. Look down, and apply mascara to the base of the lashes with an outward motion. 4: If you want to intensify the look for night, just use a bit more product and do an extra coat or two.